The trouble with a WordPress site is the fact that it is never perfect. You know the drill – no matter how good it looks, or works, you always need more from it, and you, or your set of developers, keep adding more functionalities. More possibilities mean more money in your pocket, right? Or, you put your designer to work to change button colors or make all the call to actions pop up a bit more. You could also be giving that new life-saving plugin a go so that you don’t have to send emails or create the charts and tables on your own. You could also be a developer, testing and trying new plugins. Once tested, you need to start from scratch. No matter how much time and effort you have put into your WordPress website, sometimes you just need to pull the plug and start all over again. The reasons you could have for this could make up quite a list. Why would I need to kill my website? It is a fair question. You could simply be tired of this website and want to create something new that will bring even more customers on board. Maybe you are taking your website global so your brand and overall look of your website need improvement. You could also be shifting your focus to another, better performing, product. It is also possible that you, or your developers, are using the website for testing. You definitely do not want that mess hanging around and cause your future testing efforts to turn into a headache. Pull the plug, reset the website, and try something new. Then, there are the unlucky ones, that got locked out of their site due to hacking attempts, or other issues. It is just the time to use the back-up you never thought you would need, but you cannot do it as effortlessly as you thought you could. If you restart the website from scratch, it is a piece of cake. Whichever your reason for reading this article, we don’t judge. Trust us, we get it, and we are going to hand you the solution for this tedious process on a silver plate. Considering that by default, WordPress doesn’t provide you with that option, you need a good plugin to make it happen. 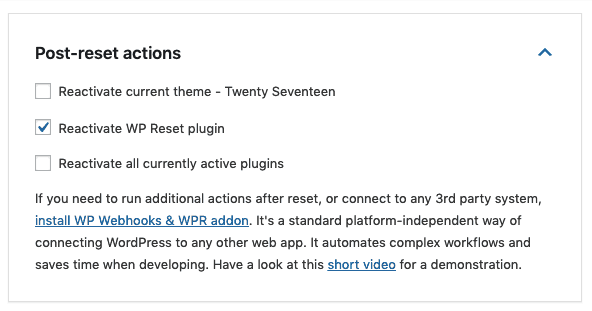 The best plugin we are letting you in on is WP Reset. WP Reset is a WordPress plugin, with its main purpose being to give you a fresh start by resetting your WordPress website to its default state. It helps with deleting all of the customizations you might have made and erasing all of the content on the site. If for any of the reasons mentioned above you need to start fresh, this plugin is quick to do it, while still taking care of your data. It will make sure that you never lose any of it, as it has several fail-safe mechanisms. Errors will not cost you an arm and a leg, and your data will remain intact. Each feature of this plugin is carefully developed and then selected with one thing in mind – helping you reset your site in the most effective, yet painless, manner. Here are all of the features you can do to do so. Not much, to be honest, except for the exact thing you installed it for. This is because the plugin is designated to get the job done for you, and to do it right. There are no unnecessary and confusing features, which have nothing to do with starting from scratch. With this plugin, you can effortlessly delete all post and pages you have created. It will delete database tables, from default ones to the custom ones that have been used by default tables. Your media entries, comments and custom post types will also vanish. And if your website got a bit crowded with users, you do not have to worry, as it will delete them, too. This seems like a lot and might be a bit intimidating. Do not worry, you won’t get deleted from your site. The currently logged in user will be able to keep his or her username and password. After the reset, he or she will get logged out and then immediately logged back in. If you are looking to cut someone off the project badly, this could be the help you needed. It will also NOT delete any files. From media files which you uploaded in the wp-upload folder, to plugins or themes, you can be sure it will stay right where they are. Also, you get to keep the addresses, both WordPress and site one, site’s title and language stay, too. Google will still be able to find you, as it will not mess with your search engine visibility settings. 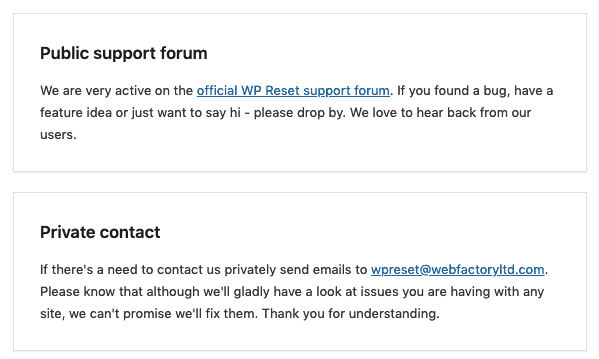 If you plan on doing the reset quite often, you can make sure that WP Reset plugin stays, too. Just enable it to re-open, in the post-reset settings so you can do this all over again, without having to do it from step one. It is the fastest solution out there, which could have reset your website by the time you finished reading this paragraph about it. If you are looking to start from scratch, and create something entirely different, then head out and click “Reset”. A couple of seconds is all it takes, and you will have a blank page to work with. Considering that this plugin is made for developers who love typing commands rather than clicking buttons, it is fully compatible with WP-CLI Support. Thanks to this, those fast typing developers can open their command line tool and start from scratch as easy as possible without having to actually click anything. In case you are not really clear on what you are doing, or if you are not sure how to do it properly, there is no need to pawn it off to someone else – and to have to pay for that! Good news is, the team that brought this plugin to life is available to help you out with your struggles, for free! The best help you could probably get, as they developed the plugin and are using it daily, which means they know it inside out. The main concern for doing this reset in the first place is the consideration of the time you need to get all the themes and plugins back. You took quite some time setting it up in the first place, and it would be a shame if you have to do it all over again. With Post-Reset Setup feature, you don’t need to go over the options or plugins and themes, as it will automatically configure it for you. Since WP Reset deletes all customizations, setting up some demo data after the reset can be time-consuming. Of course, the good news is that there is a copy of all WP database tables, called Database Snapshots. Each of these takes about a few minutes to create. Use these for backups, so that you can get all the demo stuff back on the website. You can also take advantage of these snapshots to restore the development environment after the testing. Additionally, you can compare them to current database tables, you can also overwrite the existing in favor of a restored one, or you can delete it. While you are restoring a single snapshot, there is no worry that it might restore other snapshots or affect them in any other way. WP Reset settings will also remain intact because you are probably going to need them again, just the way you set them up in the first place. If you are working on legacy code or testing a new plugin, getting to know what did what and what is a result of an action can save you days of trial and error. This is another way the above-mentioned snapshots can be handy. With a single click, you can check out what a specific plugin did, and which changes it created to your database. It will provide you with a visual representation of the data, and you can easily see the custom tables it created. If the plugin has modified or deleted a table, you will be able to see that, too. Its impact on the site’s settings will also be visible so you can make a plan for action based on the knowledge you got instead of wasting time finding it out in the first place. Sometimes you just don’t need a completely clean slate, but you need to clean up a section or two. Uploads folder can get messy on occasion, and multiple plugins can sometimes be more of a trouble than of actual use. You can use the Selective Reset tools to get rid of some of the aspects of your website while keeping the others intact. You can use this feature to delete transients. It will delete all related database entries, and it will miss neither expired nor non-expired transients. Orphaned timeout entries will not get away either. You can clean up your themes by simply deleting all of them. Of, course, you can do the same for uploads, as we already mentioned, as well as plugins. WP Reset will remain active and ready for next resets. What’s more, this plugin can help you out clean up or delete custom tables, in a matter of seconds. If you need to get rid of your .htaccess file, you can use this plugin for that, too. 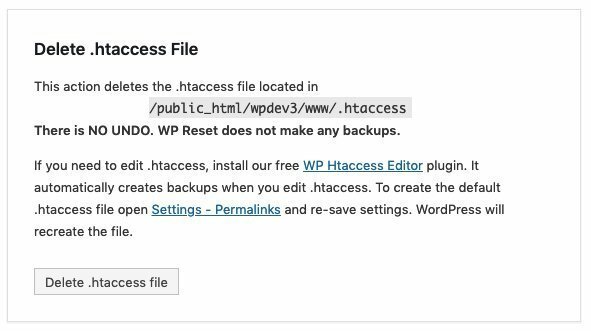 If you work with .htaccess regularly, we suggest using the free WP Htaccess Editor. If you are dreading the potential hours of manual work, you can relax. The WP Reset is fully integrated with your WP Webhooks plugin. Which means, that you can trigger anything from third-party services, and save yourself from unnecessary hours of work. Use the WP Webhooks plugin to do repetitive tasks while you deal with something much more important. Not only the team behind this plugin is available to help you out if you are struggling with existing features, but they are also actively working on adding new ones that will make your life easier. Stay tuned for these three great features that are coming soon! By now, you probably have your set of plugins that you trust to do their job and give your website the much-needed functionalities. Same goes with themes, as you have a couple of favorites to which you are familiar with already. So why would you have to go all over again installing them each time you reset your website? There should be no need. The Plugin and Theme Collections feature that is soon to be out there will enable you to create a collection, which you can later install altogether once you restart your website. We get it, sometimes you just need to nuke it. You don’t want anything there, and when you say you need it clean, you need it clean. If you need to make sure that you are starting without anything there, then a nuclear reset is very much useful. This awesome reset will become an option soon. It is planned to delete all options, files, custom database entries and tables! The WordPress Network! You might have multiple websites with the same installation, plugins, or themes, and you are looking to reset them all up. Depending on the number of sites you have, this could be a time-consuming task. The good news is that this plugin’s compatibility with it is in testing mode, to make sure that it is fully compatible. Once this is solved, and this plugin’s feature is out there, you will be able to use the tools to reset them from your network admin. This plugin is perfect for helping out developers with their testing and debugging, and speed up the development process. By clearing everything out, it allows them to start again, find bugs quicker, and make everything work impeccably in a short amount of time. Still, even if you are not a developer, you might be needing this plugin as well, due to one of the many reasons mentioned above. Starting again is never easy, but with this plugin, it will be close to effortless, thanks to its many useful features, with much more to come! Published on April 12, 2019 under developer, reset.